Jessica Chastain (Zero Dark Thirty) stars in her first true horror movie in Mama, which has the pedigree of being executive produced by horror maestro Guillermo Del Toro (Don’t Be Afraid of the Dark). The film tells the story of two girls (Resident Evil: Retribution‘s Megan Charpentier and Whitewash‘s Isabelle Nelisse) who vanish the day their parents are killed. 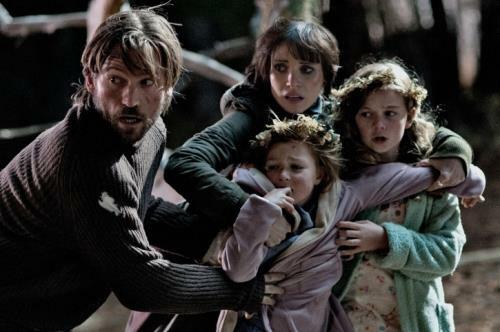 When they’re found two years later in a decrepit cabin, their uncle (Nikolaj Coster-Waldau, TV’s Game of Thrones) and his girlfriend Annabel (Chastain) take them in. As the new family tries to get comfortable, strange things happen that makes Annabel believe that someone or something came with the girls. Mama was directed and co-written by first-time feature filmmaker Andres Muschietti, who also wrote and helmed the short film this movie was inspired by. Rated PG-13, the film got mixed reviews, with critics praising its spooky style but shaking heads at its convoluted script. Still, Mama grossed a decent $71 million in theaters. commentary with Andy and Barbara Muschietti.